Marie-Antoinette may be nearly 235 years dead, but that doesn't mean France's corridors of power lack for drama queens. Scarcely 48 hours before the opening of the G-20 summit in London  where divided leaders face the formidable challenge of finding a consensus strategy to reverse the global economic downturn  President Nicolas Sarkozy threatened to walk out of the meeting if his fellow heads of state fail to heed his demands for muscular international regulation of financial markets. 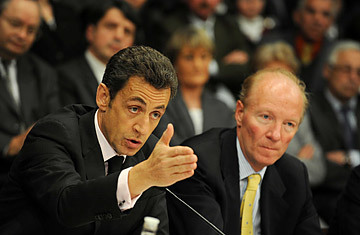 "I said, 'I want results,' " Sarkozy explained on Tuesday, when asked about his threat to walk out. "It's in everyone's interests to get results." France, of course, is on one side of an increasingly stark policy divide among key players at the G-20. The U.S. and Britain are urging that the immediate priority be for governments to collectively launch deep-pocketed stimulus packages aimed at reviving the demand that will spark economic recovery; for London and Washington, ambitious international regulation of financial markets is, at best, a secondary priority. But France and Germany, backed by most of the European Union, reject the "Anglo-Saxon" plans for debt-financed stimulus packages and argue that these simply put off dealing with the permissive regulation environment that allowed the unchecked avarice of bankers, hedge-fund managers and finance companies to plunge the world economy into calamity. Between those poles lie countries such as Brazil, India and China, which are skeptical of the chaos wrought in the global economy by the supposedly sophisticated Western governments that have long lectured others on matters of economic policy. "Although everyone is angry and concerned, what really has to happen is for everyone to stop playing the blame game and face that reality that difficult effort will have to be made by each nation for the collective salvation," says Simon Tilford, chief economist of the Center for European Reform in London. "The U.S. and U.K. are going to have to say some things continental Europeans want to hear about measured regulation over time. And those European states are going to have to admit their economies need far more funding and help to stop what's now become even more dramatic decline than the U.S. has experienced." How does that happen when leaders like Sarkozy are engaged in what Tilford calls "petulant and childish brinksmanship"? Does that mean Sarkozy's histrionics behind demands for greater controls and scrutiny over the operations of the international financial system are simply theatrical? "No, he's capable of walking out if he has to  threatening scandal is a classic tactic to get more from your partners," says Sylvie Matelly, an economist and international-affairs expert for the Institute of International and Strategic Relations in Paris. "He's aiming to get concessions to very real French and German concerns about how this crisis must be handled. If he gets those, it's total victory. If he gets lip service, he does what he did so well in November: market a largely empty accord as a big breakthrough." "Even if he doesn't leave the meeting as threatened, he stands to gain support," Matelly adds. "Not just in France and Europe, but in emerging countries who want something dramatic done fast." Tilford believes Sarkozy's threat was a message to British Prime Minister Gordon Brown to "halt his drift from the rest of Europe to full partnership with the U.S. position, or [the Frenchman would] ruin a summit critical to Brown's political standing," Tilford says. But Sarkozy's strategy could have unintended consequences. "If it keeps insisting the British-American position is simply wrong and refuses to budge, Europe may surrender its credibility in the view of the open-minded, multinationalist U.S. President it's been asking for for so long," Tilford notes. "It's critical to avoid that now, because in six to eight weeks  as unemployment zooms higher still  most of Europe will realize it's in far more dire straits than it would admit. And then it will have no choice but to turn to the stimulus options it now disparages." See TIME's special report on the G-20 summit.